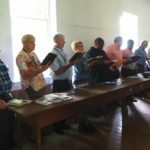 On October 2, 2015, a new book published by the Historical Society will be released at Ashland Theological Seminary in Ashland, Ohio. 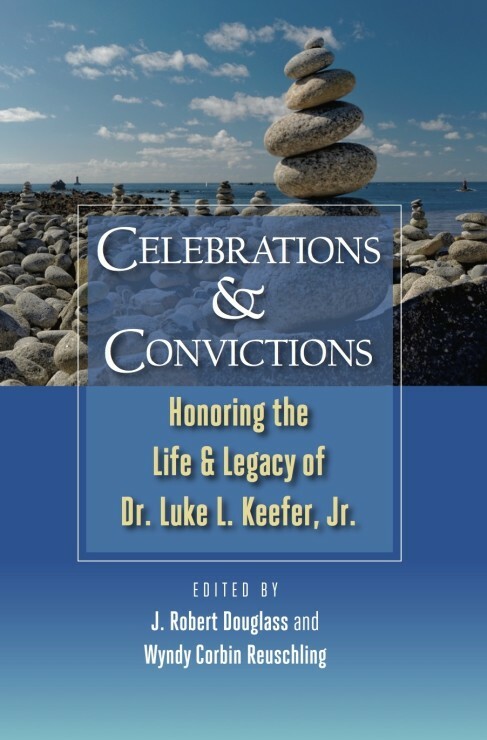 The book is Celebrations and Convictions: Honoring the Life and Legacy of Luke L. Keefer, Jr., edited by J. Robert Douglass and Wyndy Corbin Reuschling. The introduction by John C. Schultz, president of AshIand Theological Seminary, is reprinted here as a preview of the book which contains essays exploring a variety of commitments and convictions that were important to Luke. Luke Keefer wore a tan, camel hair sport coat almost constantly during fall and winter and a maroon one in spring and summer. I vaguely recall a few others, but I do not think he had more than four or five. And he was not concerned about wearing the same one many days in a row or about driving to work at Ashland Theological Seminary in a pickup truck that most people would have sent to the salvage yard many miles before. Every time I get these images of Luke, I am challenged by his example to live simply and frugally and to not be so concerned with “treasures here.” In my opinion, that was the defining characteristic of Luke Keefer’s life. His beliefs, teachings, and actions were consistent and were shaped by his relationship with the Lord and his understanding of the Word. He was not swayed to the right or the left by the opinions or judgments of others. He was diligent in examining his thoughts and behaviors, and in seeking to align them with his commitment to Christlikeness. Not only did he see the Brethren in Christ theological streams of Anabaptism, Pietism, and Wesleyanism as integrated into his denomination’s doctrines and practices; he was a living example of integrating them into one’s personal life. I believe that is why virtually everyone who encountered Luke, whether as a pastor, teacher/professor, colleague or friend, describes him in remarkably consistent and similar ways. Throughout this festschrift in honor of Luke, I suspect it will seem that all the authors gathered in a room and agreed on his attributes and contributions that this project would highlight. While this is not the case, it does demonstrate that everyone who encountered Luke Keefer, regardless of the role he was playing, met the same person. A faculty colleague described him as someone who brought a singular voice of reason, tempered with compassion, sharpened with intellectual inquiry, and grounded in unwavering faith. While this sentence sounds a bit over the top, it would be hard to argue that it did not accurately describe Luke Keefer. He added significantly to the legacy of excellence at Ashland Theological Seminary that was begun by his Brethren in Christ predecessors, Dr. Owen Alderfer and Dr. Arthur Climenhaga, and was continued by Drs. Fred and Grace Holland. It is impossible to overestimate the impact that these five scholars and wonderful Christians had on Ashland Theological Seminary as an institution and as a community. As friends, Luke and I had the usual connections that “Pennsylvania boys” often have. We cheered for the Penn State Nittany Lions together, swapped deer hunting stories, and discussed his latest challenges in keeping that old truck running. I will always cherish the quarter that we taught together at our Detroit campus. The weeks that we spent together making the six- hour round trip were filled with great conversations that encouraged me as a faculty colleague who was ten years his junior. In spite of the differences in age, experience, and wisdom, Luke never said or did anything that made me feel inferior or less than an equally valued member of our team. Over the years, we had a few disagreements about programs and on one occasion, the promotion of a fellow faculty member. I was chair of the department of which that professor was a member. Luke was chair of the Personal and Professional Committee, the group that made final decisions regarding faculty promotion at Ashland Seminary. The committee decided against the promotion of a professor in my department. Luke and I had an “energized” conversation about the decision and in the end, Luke agreed that their decision was in error and unfair. I was taken aback by the ease with which he changed his mind and with the grace he exhibited through the whole process. His humility, in light of his considerable knowledge, wisdom and experience, was remarkable. As a faculty colleague, the other professors at Ashland Seminary respected Luke as a master teacher. While students may have had the usual complaints about most of the faculty members, I was never aware of any negative word among the student body about Luke’s knowledge and effectiveness in the classroom. When he preached in chapel, he would enter the pulpit in a rather unassuming manner belying the effect his message was about to have on the audience. His sermons were always impactful. His depth of understanding of the Word, his clear exposition, and his practical applications all served to send the listener out with a profound sense of having heard from the Lord. When I became president, it was reassuring to have Luke on the team. He brought a clear, calm voice of reason to the various campus deliberations, and his voice was always given attention and respect. Since his retirement, I have sorely missed Luke’s presence as we work to meet the present challenges in theological education. I am certain that his perspectives and advice would have been invaluable in our circumstances. As was the case in every aspect of his life, Luke was an active participant in the life of the seminary. He was always present at campus-wide events and readily engaged in whatever activities were planned—athletic, table games, or eating (especially if ice cream was on the menu). The impact of his connections to the students he mentored—there were many—was profound and will continue for many years to come. While it is altogether fitting and proper that this book be written to pay tribute to Dr. Luke Keefer for the kind of person he was, and while it behooves us all to consider the ways that he has impacted our lives, and to seek to emulate his commitment to the two great commands, it is the continuation of his work as a churchman, scholar, and theologian that makes this project most valuable. It is unfortunate, both for the Brethren in Christ denomination and for the wider community of scholar/historians, that the opportunity to serve Messiah College’s Sider Institute for Anabaptist, Pietist, and Wesleyan Studies after his retirement never came to full fruition. 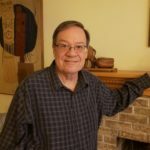 It is regrettable that we will not be able to benefit from Luke’s ongoing thoughts and ever evolving perspectives on the myriad topics of which he was so knowledgeable. Thus I am grateful for the initiative taken by Dr. Wyndy Corbin Reuschling and Dr. Rob Douglass in proposing this festschrift. Without their vision and organizational efforts, this project would never have reached completion. It is my prayer that these essays will expand an awareness and understanding of Brethren in Christ faith and practice in ways that are beneficial to a wide variety of faith communities, and help us to celebrate the life and legacy Luke Keefer, while extending the commitments and convictions of our colleague and friend for many years to come. After October 2, 2015, the book is available for purchase for $15. 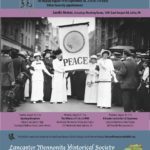 Contact the Historical Society.